Carprieve 50mg Flavoured Tablets provide effective treatment for chronic cases of musculo-skeletal inflammation in dogs. 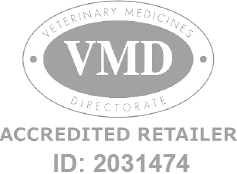 Carprieve Flavoured Tablets - 50mg is a Prescription Only Veterinary Medicine and by law requires a prescription from your vet. Carprieve 50mg Flavoured Tablets provide effective treatment for chronic cases of musculo-skeletal inflammation in dogs, such as degenerative joint disease. Commonly referred to as Osteoarthritis, degenerative joint disease is a progressive, long-term deterioration of the cartilage surrounding joints, which causes stiffness and long periods of inactivity. Carprieve is a non-steroidal-anti-inflammatory drug (NSAID) effective in controlling the pain and inflammation associated with Osteoarthritis in dogs.